The Mil Mi-14 (Russian: Миль Ми-14, NATO reporting name: Haze) is a Soviet shore-based nuclear-capable amphibious anti-submarine helicopter derived from the earlier Mi-8. Formal development of an anti-submarine warfare (ASW) version of the Mil Mi-8 transport helicopter was authorised by the Soviet Communist Party Central Committee and Council of Ministers in April 1965, with the objective of replacing the Mil Mi-4 in the short-range, shore based anti-submarine role. The new helicopter was required to have an endurance of 2 hours on station at a radius of 222 kilometres (120 nmi; 138 mi) from base. The new design (with the internal designation V-14) differed from the Mi-8 in having a boat-like hull similar to the Sea King, allowing it to operate off the water, and a retractable four-point undercarriage,[N 1] with the mainwheels retracting into large sponsons on the rear of the fuselage. The helicopter was to be powered by two Klimov TV3-117MT turboshaft engines. A watertight weapons bay is fitted to the centreline of the fuselage allowing internal carriage of a single torpedo or eight depth charges, while a radome housing a search radar is fitted beneath the nose. The first prototype V-14, converted from a Mi-8 and powered by the older and less powerful Klimov TV2-117 engines, flew on 1 August 1967. Development was slowed by problems with the helicopter's avionics and due to reliability problems with the TV3-117 engines, with production at Kazan not starting until 1973, and the helicopter (now designated Mi-14) entering service on 11 May 1976. Allegedly due to the strong pressure from the United States, all Russian antisubmarine Mi-14 helicopters were decommissioned in 1996. [unreliable source?] 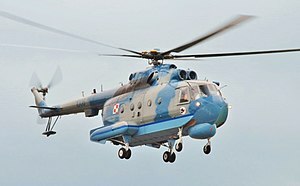 In May 2015, RT has reported that Mi-14 is being highly sought after by the Russian Black Sea and the Northern Fleets, and that Kazan Helicopter Works (KVZ) is preparing to return 10 previously decommissioned helicopters to active Russian Navy service with the production of new units beginning within five years. The initial demand was estimated at 100 helicopters. In January 2016, Russian Helicopters confirmed to Russian News Agency TASS that no final decision to revive production had been taken, but market demand, feasibility studies – including with Moscow’s defence ministry – and funding sources were under review. The programme remains a “priority” for Russian Helicopters. The company suggested the Mi-14 would appeal to civil operators in Russia’s far north and those supplying the oil and gas industry, alongside the nation’s armed forces. Out of the almost 300 Mi-14s produced at Kazan Helicopters between 1973 and 1986, it is estimated that just 44 examples remain in active service. Anti-submarine warfare helicopter, equipped with towed APM-60 MAD, OKA-2 sonobuoys and a retractable Type 12-M search radar, armed with a single AT-1 or APR-2 torpedo, one Skat nuclear depth bomb, eight depth charges. A single Mi-14PL was used to carry out trials with the Kh-23 (NATO designation AS-7 Kerry) air-to-surface missile but this modification does not seem to have entered service. Improved anti-submarine warfare version with Os'minog ASW suite, with new search radar, dipping sonar and digital computer. Limited use. Polish conversion of two Mi-14PŁ (Polish designation for Mi-14PL) to search and rescue version, with ASW equipment removed, developed in 2010. Mine sweeping helicopter with ASW systems removed and equipped for towing Mine Countermeasures sleds. 25–30 built, with six exported to East Germany and two to Bulgaria. Search and rescue training helicopter for the Polish Navy (unofficial designation). One Polish Mi-14PŁ helicopter was temporarily converted into the Mi-14PX, then converted back in 1996. Conversion of Mi-14PL to 24–26 seat civil passenger transport. By 1991, about 230 had been delivered, with exports to many Soviet allies including Bulgaria, Cuba, East Germany, Libya, Poland, and Syria. ^ The first retractable undercarriage to be used in a Soviet helicopter. ^ Mladenov Air International March 2001, pp. 184–186. ^ a b c d e Mladenov Air International March 2001, p. 186. ^ a b c Gunston 1995, p. 238. ^ a b "Re-commissioned? Soviet nuke-capable sub-killing copter comeback slated". RT. 13 May 2015. Retrieved 3 June 2015. ^ "Russian Helicopters still analysing revival of Mi-14 amphibian". FlightGlobal. 12 January 2016. ^ Mladenov Air International March 2001, pp. 187–188. ^ Mlandenov Air International March 2001, p. 188. ^ a b Mladenov Air International April 2001, p. 244. ^ a b Adam Gołąbek, Andrzej Wrona, Śmigłowce Mi-14PŁ/R w służbie, in: Lotnictwo Nr. 7/2011, pp. 40–47 (in Polish). ^ Mladenov Air International April 2001, p. 245. ^ a b Mladenov Air International April 2001, p. 246. ^ a b c d e f g h i "World Air Forces 2018". Flightglobal Insight. 2018. Retrieved 1 December 2017. ^ a b c "World Air Forces 2013" (PDF). Flightglobal Insight. 2013. Retrieved 5 April 2013. ^ "Volksmarine Mil Mi-14 "Haze"". Retrieved 5 April 2013. ^ "Marineflieger Mil Mi-14 "Haze"". Retrieved 5 April 2013. ^ "World Air Forces 1987 pg. 86". flightglobal.com. Retrieved 5 April 2013. ^ "World Air Forces 1997 pg. 71". flightglobal.com. Retrieved 5 April 2013. ^ Lambert, Mark. Jane's All the World's Aircraft 1992–93. Coulsdon, Surrey, UK: Jane's Information Group, 1992. ISBN 0-7106-0987-6. Mladenov, Alexander. "Cutting through the Haze". Air International, March 2001, pp. 184–188. ISSN 0306-5634. Mladenov, Alexander. "Cutting through the Haze: Part 2". Air International, April 2001, pp. 244–247. ISSN 0306-5634. Wikimedia Commons has media related to Mil Mi-14. This page was last edited on 21 September 2018, at 23:54 (UTC).